Fishing Trips Coeur d’Alene Idaho: Those of us here at CDA Adventures think that there is no better day to spend than with your sweetheart, buddy or family than floating down a beautiful river, catching fish, and eating wonderful food. CDA Adventures offers two regions in which to have 8 different adventures fishing with some of the most experienced guides in the Northern Idaho and Western Montana areas. Both watersheds provide the opportunity to catch the native cutthroat, rainbow, and brown trout. Full days and half days are available for both areas. 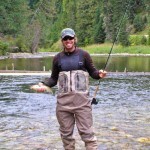 We are one of the few outfitters that offer an incredible fishing and rafting combined trip. 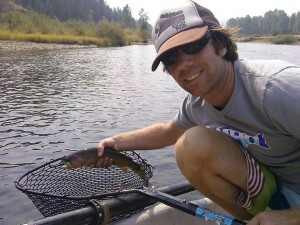 Think rapids and catching a 20” trout 30 seconds from each other while meandering through breathtaking scenery. We call it the combo trip! *CDA Adventures features local river trips on the Clark Fork and Coeur d’Alene River. *We also offer trips over the border in Montana. It takes 90 minutes to get to some of the river trips and two hours to get to our shop in MT and trips are offered on the Bitterroot, Blackfoot, and Clark Fork Rivers. Participants will experience local watersheds, breathtaking scenery, and unique wildlife from their local and very informative guides. Scroll through our 8 trips below! We offer a world class destination trip o the Clark Fork River, just over the MT/ID border on the Alberton Gorge whitewater stretch of the Clark Fork River. 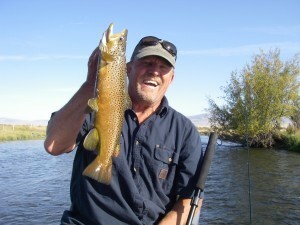 Our customers frequently say that the Combo Trip is the most exciting day they have ever had on a fishing/rafting trip. Most of the bigger fish in the river hold up in the pools at the bottom of the rapids so you never know what you might catch. You will have to wear a life jacket for all 15 rapids, and all the gear gets put away for Triple Bridges, Tumbleweed, and Fang rapids but you can cast away on everything else! The Combo Fishing and Whitewater Adventure is very scenic and rarely fished. This unforgettable trip can be done by gear fishing and/or fly fishing. Read more information! We offer this trip April through November, weather permitting. Maximum of five people can be accommodated, but would need to be gear (spin) fishing for boat and equipment management. 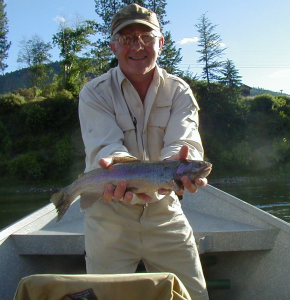 The Clark Fork is noted for Rainbow, Cutthroat, Brown and Bull Trout. There are 30 miles to pick from when booking your trip. The forest banks provide views of deer, elk, beaver, osprey, eagles, kingfisher, geese, and the occasional moose. We see a blue heron almost every trip. The river flows through a beautiful canyon for one stretch and features a small white water rapid on another stretch. 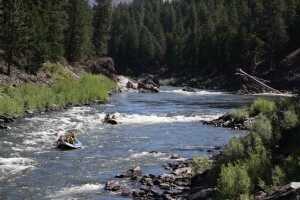 This river trip is unforgettable, and located on the border of MT and ID. We feature one of the best lunches on the river. Quinns Hot Springs and a forest service campground are located nearby with a great hike to a waterfall. A recreational paradise or getaway. This trip is 90 minutes from Coeur d’Alene with an option to do a stretch which is a two hour drive. The Clark Fork is the largest river in Montana by volume keeping water temperatures tolerable and fishable all summer long. We fish this river April-October. The Coeur d’Alene River features some of the finest scenery in Northern Idaho. It is a healthy fishery, filled primarily with cutthroat. Join us for a full day or half day fishing adventure! We fish this river April-October. 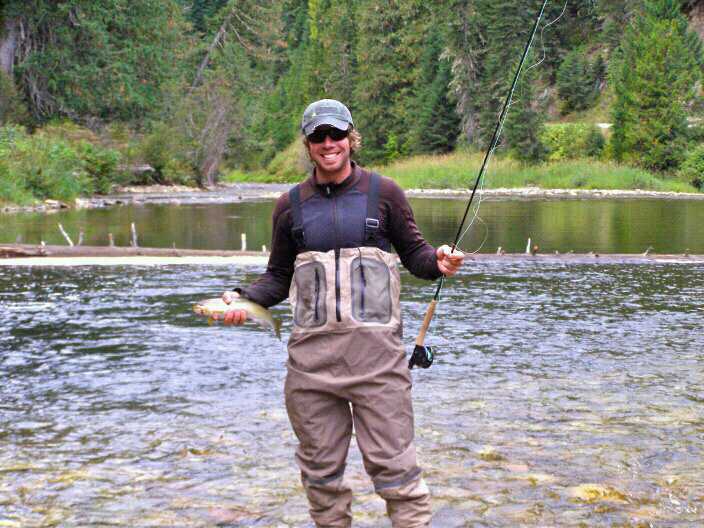 This is one of the best fishing trips in Coeur d’Alene, Idaho! 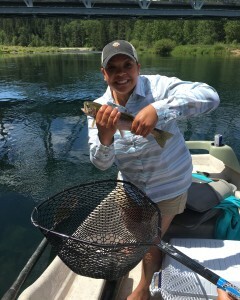 The main attraction to this particular body of water is a native fish called the Westslope Black Tail Cutthroat Trout. There are also Rainbow trout in this watershed. Water flows are higher in May and June therefore timing on this river is essential. Half day trips are usually 4 to 5 hours depending on water flow. We have morning or afternoon departures. There is a Salmon spawn on this river that is beautiful to see. 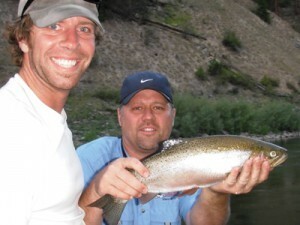 This Coeur d’Alene River Fishing Trip is offered by boat courtesy of Outfitter #8913. 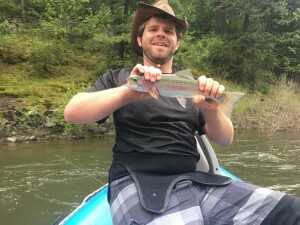 All other outfitters fish this sections of the river by wade fishing and it’s a beauty to visit all the wonderful fishing holes and true North Idaho scenery on a raft or boat. Book your half day or full day trip and you won’t regret it. Already an experienced angler? Get to know the river through a guide. It will pay off for years to come as an investment in the knowledge of this river our guides have to offer. 12 Years in the business of guiding experience has earned us a reputation as having the most knowledgeable guides in Western Montana. We track the river flows, follow the hatches, and understand how the wild and unpredictable weather affects our rivers and streams. This Half Day Trip meets on one of three sections of the Clark Fork River in which we fish. Some sections fish better in the morning, others fish better different seasons. We guide fish the Clark Fork April through October. This beautiful trip can be done by gear fishing and/or fly fishing. Our meeting locations vary depending on sections fishing. This fishing trip is done by drift boat and is a 90 minute drive from CDA. 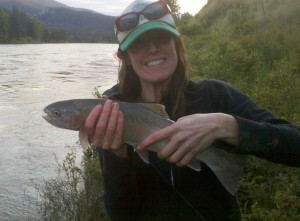 The Clark Fork River in Montana holds rainbow, cutthroat, and brown trout. 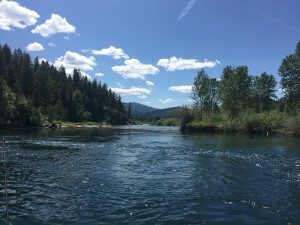 The Clark Fork is majestic and is known for large fish, and our expert guides will be sure to do their best with the flies or lures in order to make your trip a success for learning this river or having a new experience! We’ll match you with a guide that is right for you. 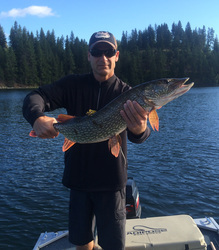 Considered the best warm water fishery in Northern Idaho, we book through Outfitter #8913 which has exclusive guide permits on a lake fostering Pike and Bass worthy of a feature story in Field and Stream! 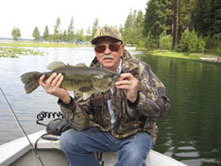 The Hayden Lake Fishing Trip is located only five miles northeast of the City of Coeur d’Alene. Hayden Lake is surrounded by forest covered shores and beautiful homes. This makes it one of the most beautiful and popular lakes in the Inland Northwest. Reaching 178 feet in depth and covering 3800 surface acres, Hayden Lake’s irregular shape provides forty miles of shoreline. It is fed by streams and springs. The main portion of the lake runs seven miles long and nearly two miles in width. Three sides of the lake are surrounded the timbered Coeur d’Alene Mountains, which rise to an elevation of 4,500 to 6,000 feet. This land is part of the Idaho Panhandle National Forest, an area rich in history and outdoor opportunities. If you haven’t tried pike and bass on the fly, we highly recommend it. Hayden Lake also holds some of the largest crappie known to fly anglers. It also holds trout. This trip can be done by lure or fly rod. There is a pontoon to take large groups out on the lake. 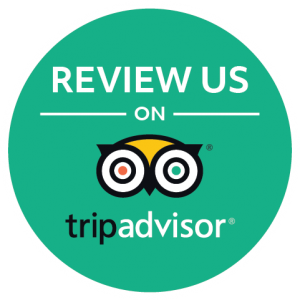 Please call us to arrange a price and trip or book online! Our pontoon can hold up to 11 people. Guests non-fishing are $50 per person, Fishing guests are $75 each. Please call to book the Pontoon on Hayden Lake! 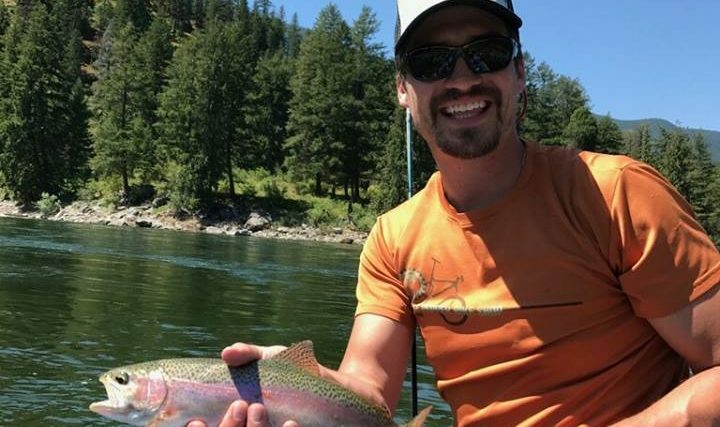 *Local Favorite and Vacation Best Seller* The Coeur d’Alene River Fishing Trip is on the main part of the Coeur d’Alene River and is done by drift boat. It features some of the finest scenery in Northern Idaho. It is a healthy fishery, filled primarily with cutthroat. Join us for a Full Day or Half Day Adventure! This fishery is the closest trip from Coeur d’Alene. It is fed by spring water which allows us to float it year-round. The Coeur d’Alene River flows into Lake CDA and eventually this stream becomes the Spokane River as it flows out of Coeur d’Alene Lake towards Spokane, WA. The Coeur d’Alene River is home to us and is our go-to spot. 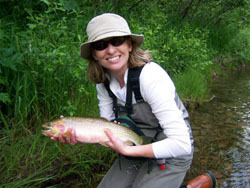 It has ample dry fly fishing for Westslope Cutthroat Trout. The main attraction to this particular body of water is a native fish the Westslope Black Tail Cutthroat Trout. This genetically mutated fish exists only on the CDA. A fun fact for you is that all of the real bodies of water in the film Dante’s Peak were either the Coeur d’Alene River or one of its tributaries. Because of its proximity, the Coeur d’Alene River Fishing Trip is one of our best in fishing trips Coeur d’Alene Idaho! We guide fish the CDA April-October. This is the perfect trip for someone wanting to get to know the rivers surrounding them. It is also an epic three day vacation for the fishing enthusiast. 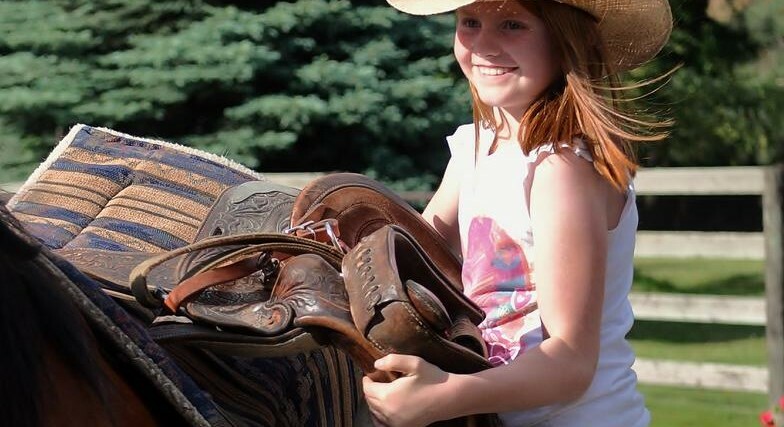 The Trifecta Trip is the best featured trip in Western Montana and North Idaho. This trip is offered exclusively through Coeur d’Alene Adventures and Adventure and Adventure Missoula, our rafting company with headquarters on the Clark Fork River. The Tri Trip came about because our guides have the know-how, knowledge, and capacity to entertain guests, catch huge fish, and possess the talent to manage the gear a white water trip requires. We need to keep guests safe and have an epic three day vacation of their life being successful on the river. This trip includes one day each on the Bitterroot, Blackfoot, and Clark Fork rivers for $1050 or $1,305 for two people. Many want to experience the infamous world-class whitewater combo fishing trip on the Clark Fork. Make this addition for an experience of a lifetime for $75. Spin or Fly Fish (your choice!) We’ll match you with the guide required for the river stretches of your choice and season dependent. Hardly anyone fishes the large pools on the Alberton Gorge whitewater stretch of the Clark Fork. It is not to miss while in this area. Read more info here.